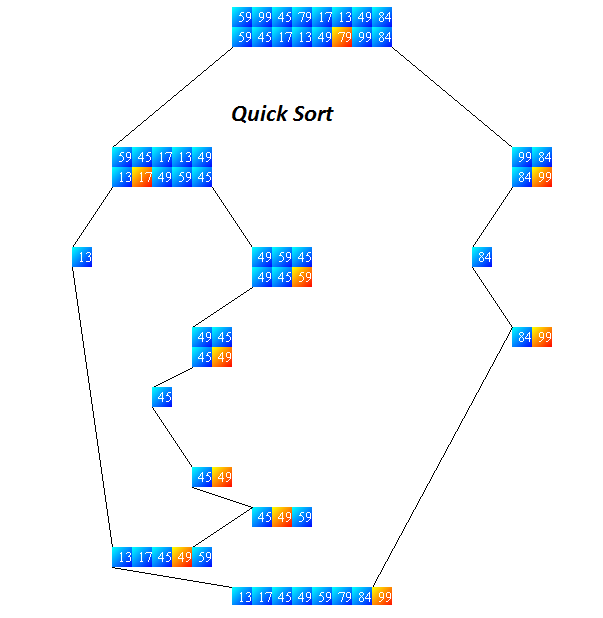 Quick Sort is divide and conquer algorithm like Merge Sort. Unlike Merge Sort this does not require extra space. So it sorts in place. Here dividing step is to chose a pivot and partition the array such that all elements less than or equal to pivot are to the left of it and all the elements which are greater than or equal to the pivot are to the right of it. Recursively sort the left and right parts. The key to the algorithm is the partition procedure. A 'partition' element is chosen. All elements less than the partition are put in the left half of the array, all elements greater than the partition are placed in the right half of the array. The two halves are sorted independently and recursively. n is the total number of elements in the list) O(nlgn). n is the total number of elements in the list) and other of size 1 O(n2). 4. It is not stable and uses O(lg(n)) extra space in the worst case. Books from Amazon which might interest you ! we have not seen which is like shown below. If the new element we encounter than >=pivot the above variant is still satisfied. If it is less than pivot we swap a[j] with a[i+1]. MCQ Quiz: Efficient Sorting Algorithms- Quick sort, Merge Sort, Heap Sort- Check how much you can score! Here's a Java Applet Visualization which might give you a more 'colorful' idea of what happens in Quick Sort.